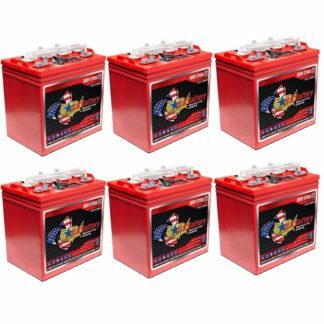 These 12 Volt Golf Cart Batteries US12VRX 155Ah US Battery | 4 Pack | 48V System ClubCar Ezgo Yamaha are loaded with power to propel your golf cart where ever you might point it. The US12VRX 12 Volt 155Ah Battery from U.S. Battery has incredible deep cycling abilities and is the perfect fit for your golf cart, marine or RV house bank battery system, floor scrubber or other industrial applications where deep cycle batteries are required. Made in America, U.S. Battery has exclusive XC2™ formulation and Diamond Plate Technology®. This Technology allows their batteries to reach peak capacity very rapidly. Their batteries have higher total energy delivery, and an extended battery life over other traditional lead acid batteries. Now with the new high charge efficiency design they also meet California Energy Commission regulations for combined charger/battery charge efficiency. U.S. Battery’s unique design and variety of sizes in 6, 8 and 12-volt battery applications make them some of the most compatibility batteries in the field. U.S. Battery’s proven manufacturing processes continue to make them one of the most trusted battery brands in the world for almost a century. Synthetic TTBLS (tetrabasic lead sulfate) additive in the paste mix provides uniformly controlled crystal size of the resulting TTBLS in the cured plate and higher conversion efficiency of TTBLS to lead dioxide in the formed positive plate giving higher capacity. The same controlled TTBLS crystal size results in a higher conversion of TTBLS to lead dioxide in the cycled positive plate with greater and more uniform porosity and surface area for higher peak capacity. Since there is no increase in the size or weight of the battery, higher capacity translates to improved energy density (watt-hours/liter) and specific energy (watt-hours/kilogram). The more uniform crystal structure of the formed positive plate results in enhanced recharge-ability particularly at low temperature and from varying states of discharge. Uniformly controlled TTBLS crystal size results in a stronger crystal network within the formed positive plate active material resulting in decreased shedding from vibration and shock. The crystal network within the formed positive plate active material also results in decreased shedding from deep cycling – the primary failure mode in deep cycle batteries.